First, let’s go to the West Coast where many resort hotels are lined up. After leaving Busena Marine Park near The Busena Terrace in Nago City, and passing the downtown, then Nakijin Village. Cross Kouri Bridge after Yagaji Island, and Kouri Island is right there. 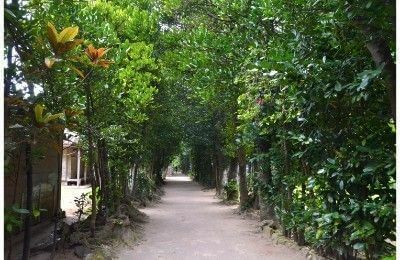 Return to Yagaji Island, cross Warumi Bridge which opened in 2010, and head to Bise Fukugi Trees in Motobu Town. It takes about 10 minutes to Okinawa Churaumi Aquarium on foot. Go back to Nago City again for a dinner. You can have a panoramic view of the 4 meter depth underwater at the observatory, which is located at 170m offshore of Cape Busena. The view of colorful tropical fish reminds of the underwater castle. It is indoor observatory, so you can enjoy the view even on rainy days. Also, you can see tropical fish closer from a whale-shaped boat because bottom part of this boat is made of glass. Enjoy strolling under the sea with your clothes on. Kouri Island is the small island which takes about 20 minutes by car to go around. 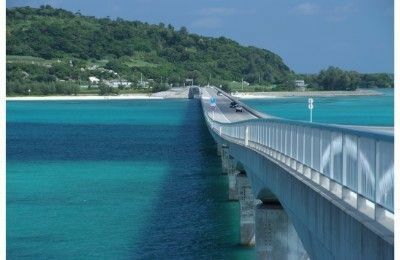 You might feel like driving over the ocean when you cross Kouri Bridge which is connected to the island. 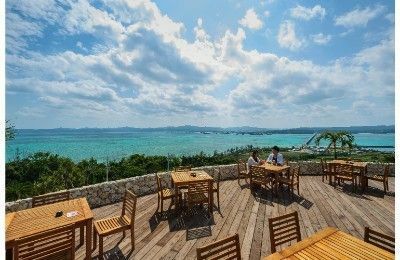 Kouri Island is also called as “the Love Island,” and Okinawan version of Adam and Eve legend is passed down in this island. “Heart Rock,” the heart-shaped rock which floats on the ocean, is a hot topic that everybody talks about. 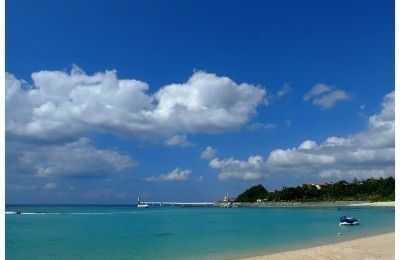 You might feel sweet when you visit Kouri Island. Kouri Ocean Tower, the white building with triangle-shaped rooftop, is standing on a hill where you can see from Kouri Bridge. 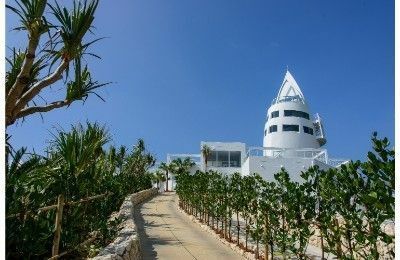 Guests can visit a museum which over 10,000 of shells from in & out of Japan are exhibited, and the scenic view of the ocean at an observatory tower is breathtaking. A restaurant that serves special curry and pizza is also located within the Tower. Sweets using local products in Kouri Island are produced and available at a shop. These are good for souvenir. Bise is a community, which is near the north gate of Ocean Expo Park, and is located along a coastline. Fukugi (common garcinia) trees using as a windbreak are beautiful, and the blue ocean shows up after going through the trees. 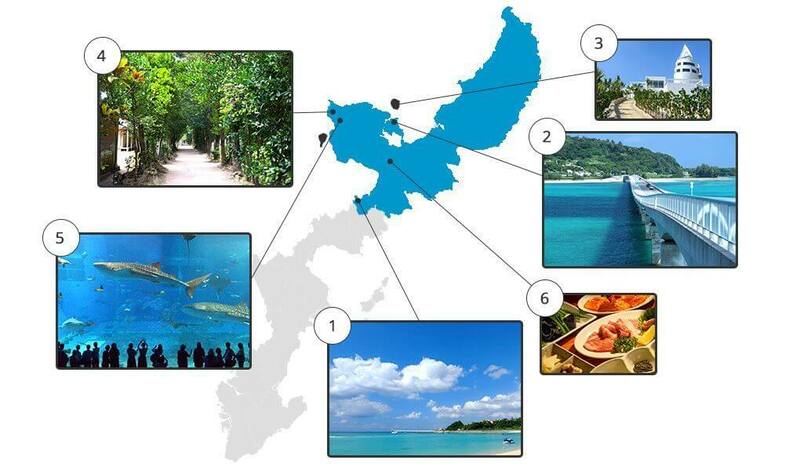 Ie Island is viewable as well, and it is about 30 minutes from Okinawa Main Island by ferry. Enter from Ocean Expo Park side, walk along the coast for 15 – 20 minutes on foot, you will get to the northern tip named Bisezaki. It is good to find spots with a good atmosphere while looking at the alley. Don’t forget to bring an anti-insect spray since it is tree-lined street. 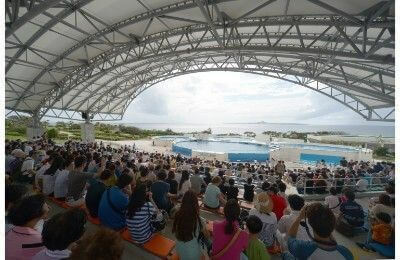 There are about 740 species and 21,000 of creatures at Okinawa Churaumi Aquarium. 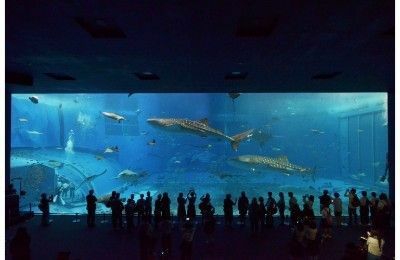 At “Kuroshio Sea” section which features one of the world’s largest acrylic tank, visitors can observe the largest fish in the world whale shark and the world’s first successfully bred-in-captivity manta rays. “Cafe Ocean Blue” is located next to the large tank. Visitors can enjoy eating dishes including taco rice, pasta, ice cream and others while whale sharks pass you by. 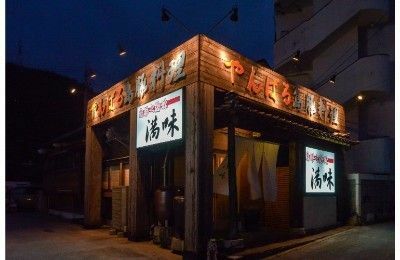 This is the popular yakiniku (BBQ) restaurant in Nago City. 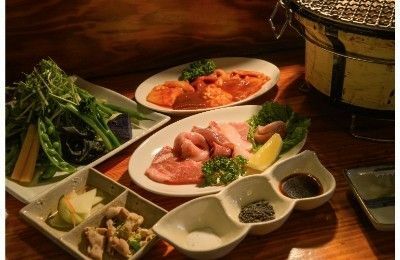 Yanbaru shimabuta (pigs which was produced in Northern Okinawa) are grown up in different environment and on different food. Each part of pork was cut differently to serve the finest meat. The rare parts of pork are only available at this restaurant.